CTV News has learned that Toronto Police were investigating the existence of an alleged video involving Mayor Rob Ford, several weeks before the story first appeared in the Toronto Star. As part of the investigation leading to the raids on Thursday, officers obtained telephone wire-tap evidence. A highly-placed source confirms to CTV News that on those wiretaps, persons of interest discussed that video in detail, and referred to the mayor's alleged presence in the video. CTV News has not seen the video, and cannot confirm its existence or authenticity. The video purports to show the mayor smoking from what appears to be a crack pipe. 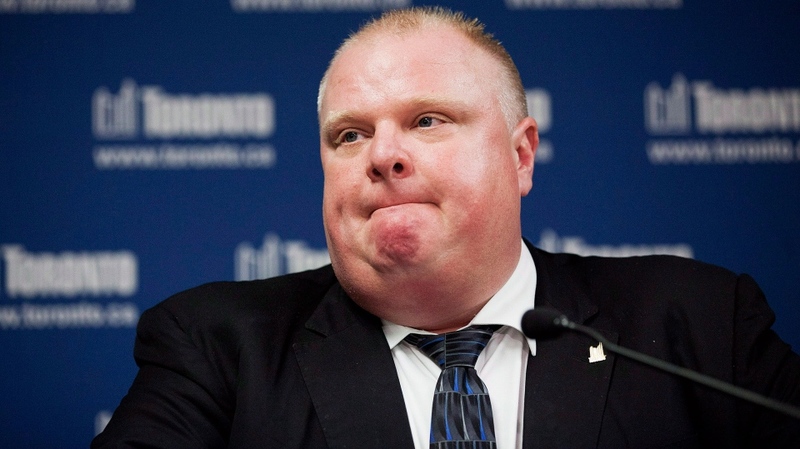 Mayor Ford has publicly denied using crack cocaine, and has repeatedly questioned the existence of the video. 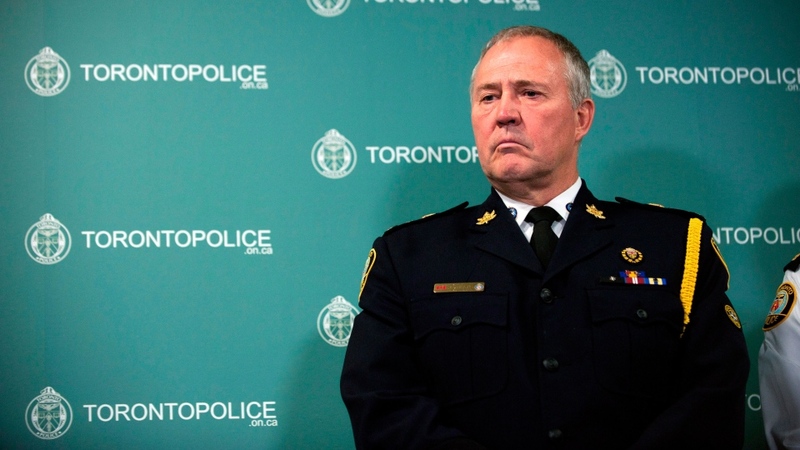 Toronto Police Chief Bill Blair held a news conference Thursday, but refused to answer questions about the methodology of the Thursday police operation, dubbed Project Traveller, the evidence collected or whether there were any possible links to Ford. "All of the evidence will come out in court, where it belongs," he said. Blair also refused to confirm or comment on the CTV News report, saying it would be irresponsible to do so. Earlier Thursday, 43 suspects were taken into custody in the Greater Toronto Area and Windsor areas as police carried out the massive, early-morning raids, which began around 5 a.m.
A total of 39 warrants were executed by more than 800 police officers from multiple jurisdictions, with suspects in the GTA taken to Toronto's 23 Division and 31 Division for processing. The operation targeted guns and drugs, and is part of a near year-long investigation. In total, 40 firearms were seized Thursday along with $572,000 in cash and millions of dollars’ worth of narcotics, police said. 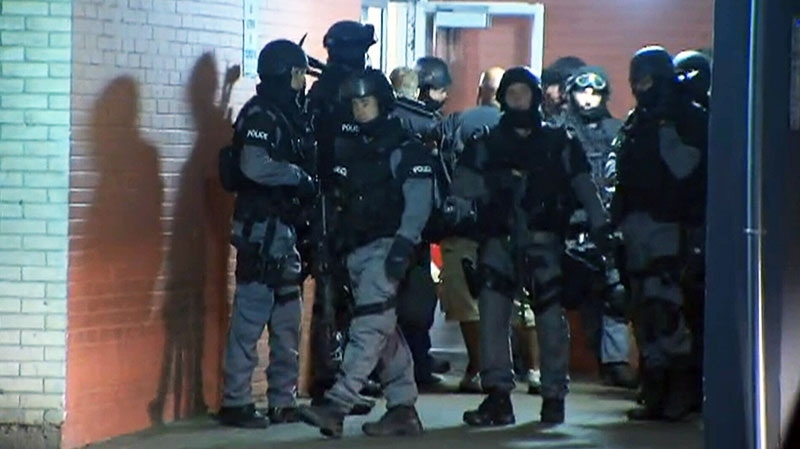 The pre-dawn raids involved officers from many GTA police agencies, including Peel, York, Halton, Barrie, Guelph, Windsor, the OPP and the RCMP. Police raided at least one suite inside an apartment building at 320 Dixon Rd., which has been in the news lately because of the drug allegations against Ford. According to recent reports, the apartment building is where the alleged crack video was stored. Police also raided the house of one of the three men pictured in a now-infamous photograph of Ford. The address is located on Mercury Road in Toronto's Rexdale neighbourhood. In reports by the Toronto Star earlier this year, the man is shown pictured with Ford and two others, including Anthony Smith, who was murdered in a downtown Toronto shooting on March 28. The man was also injured in that shooting, which took place outside a King Street nightclub. Officers were seen leaving the man’s house Friday morning around 7:30 a.m. with what appeared to be evidence bags. His home is about a 10-minute drive from the Dixon Road apartments that were the main focus of the raids. The man, who cannot be identified due to his connection to the Smith trial, was one of 35 suspects from Thursday’s raids who were taken to a Finch Avenue courthouse for their first court appearance. Arriving at City Hall on Thursday morning, Ford said he knew nothing about the raids and hadn't been given advance notice about the operation. "I don't know anything about these raids. The cable was out last night so I know as much about it as you do. I heard about it on the radio coming in. I have not been in touch with the chief so your guess is as good as mine," Ford said. Ford said he wasn't upset that police hadn't given him advance notice, saying they're doing "great" work. "I support the police 100 per cent." Heavily-armed tactical officers were seen filing into 320 Dixon and five other nearby buildings early Thursday. Officers blocked off all entrances and exits to the buildings and set up a cordon to ensure no suspects escaped. Amber Gasla, a resident who has a four-year-old son, told reporters she offered to open her door for police but the offer was declined. "I asked the officers, is that my door getting kicked down? They said no, it's not your door. I said are you sure it's not my door, because ... if you're looking for anybody I would gladly open the door and I have a key. He said no. Twenty times no. Alright. 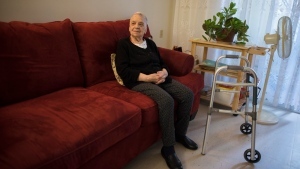 I go back up to my house as soon as they let us go, and my door is broken down," Gasla said. Before the raids, police gathered at a staging area before fanning out across the city in marked and unmarked vehicles. More than 100 vehicles, including fire trucks and more than a dozen ambulances, were part of the convoy as police struck "multiple" locations. 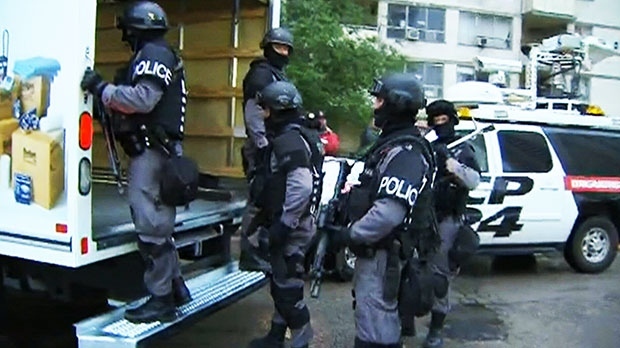 Heavily armed Toronto police officers conduct early-morning raids at 320 Dixon Road in west-end Toronto on Thursday, June 13, 2013. 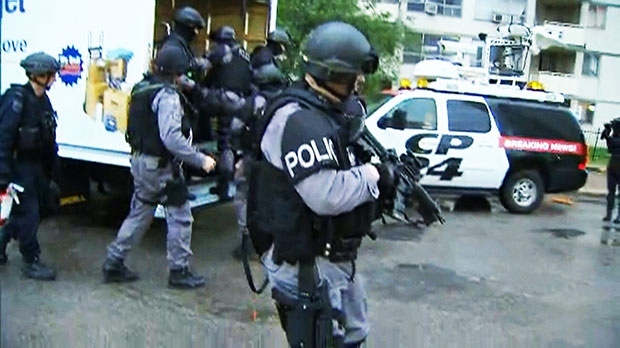 Heavily armed Toronto police officers conduct early-morning raids in west-end Toronto on Thursday, June 13, 2013.